NEWS – Henry’s high school graduation was the Sunday preceding MSOKC Race No. 4, which was a Saturday night race under the lights. My, how time flies… His challenge for the past few weeks has been to plot the most efficient course through a sea of graduation parties. We decided the day before the race to reconfigure Peter’s kart back to the class he competed in last year so that he would have other karts to race against. Conor’s kart got a new rear axle and some scheduled preventative maintenance. PRACTICE – We arrived early on Saturday to allow Peter to re-acclimate to the Briggs Sportsman configuration. He was immediately on the pace. Ironically, a new competitor showed up for the class in which he had been competing. While tuning Conor’s kart for his new axle, I was a little over-aggressive with the hex key and broke one of his wheel hubs. Thankfully, one of our fellow competitors had a new pair that we were able to buy. Henry’s practice sessions were trouble free. BRIGGS SPORTSMAN – This class had four karts in it (without Peter) for Race No. 3. One was a visitor, but two of the regulars did not show up on Saturday, which began oppressively hot and humid with a significant possibility of rain. So, Peter was once again in a class with only two karts. From pole position in the first heat, he won easily while recording lap times that were almost as fast as he went last year. Between heats, he complained of a headache. Tylenol seemed to help, but it was all he could do to get into the kart for his second heat. He plodded around behind the eventual winner and collapsed upon returning to the pits. After his last-day-of-school pool party on Thursday, all day at Kings Island amusement park in the scorching heat with his band group on Friday, up early on Saturday to help prepare for race day, and racing in the heat, exhaustion finally caught up with him. Laura had just arrived and decided to take him home and put him to bed. We arranged for a substitute driver to take the green flag for him in the feature so that he would at least earn points for his efforts. He rested most of the day on Sunday and was back to his usual cheery self on Monday. YAMAHA JR. SUPERCAN – Conor’s class had a big turnout on Saturday in spite of the possibility of rain and the hot and humid conditions. He started his first heat race from the pole position (of eleven) and motored off into the distance. The margin of victory was 7 seconds. From the ninth starting position in his second heat, he gained a position at the start and two more on Lap 2. He then caught up with a group that was battling for position among themselves. After several passing attempts, he seemed to be content staying out of trouble. A first and a sixth earned him the third starting position for the feature, which he maintained at the start. He pushed the second place kart hard and was able to make the pass in Turn 10 on Lap 5. He caught the leader at the beginning of Lap 10. This slowed his pace a bit and allowed the third place kart to catch up. These three finished nose-to tail that way. 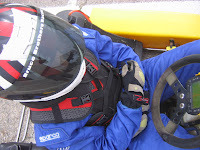 80cc SHIFTER – The random computer draw had Henry starting both of his heat races from mid-pack (of nine). He got a great standing start in the first heat, but the kart in front of him did not. Henry’s left front made hard contact with the other kart’s right rear, but only one position was lost. He made up the position on the first lap, but his lap times were slowed by a bent steering rod. He held on to finish fifth. He got a great start from fourth in his second heat and was up to second by Turn 3. He ran there to the finish while keeping the eventual winner in his sights. He started from fourth again in the feature. His start was benefited by the absence of one of the front row starters, who was missing as the result of ignition problems on the warm-up lap. When the green flag flew, he was able to squeeze in front of the third place starter and again found himself in second. He could not quite pressure the leader, but did not receive pressure from behind either. They ran that way to the finish. NEXT RACE – Conor’s results were good enough to put him back in the championship lead in his class and Henry’s were good enough to keep him there in his. We made the switch for Peter in time for him to be eligible for the championship in his ‘new’ class, but he has some catching up to do. We also need to keep him healthy, as he cannot miss a race now and still be eligible for the championship. Henry’s graduation present will have him in the UK with his friend Will Leister during MSOKC Race No. 5, which is a reverse direction race on Sunday, June 22, 2008. They will visit Henry’s cousin Sarah in London before taking a train to St. Andrews in Scotland to hang out with friends they made during a student exchange program earlier in the year. Race No. 5 will be the first time the new Bridgestone club-spec tires will be required, which we have now but have little experience with.